I would like to offer you a free download of my eBook, Leading Your Own Photo Safari. All you have to do is complete the simple form below, then you’ll get the file. 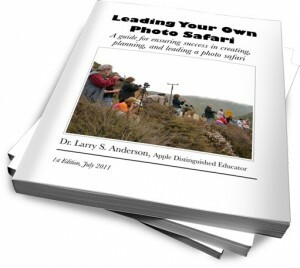 Leading Your Own Photo Safari is an eBook that will help you—or anyone—not only enjoy participating in a Photo Safari, but also to conduct your own. The ideas and experiences in this book represent many hours of loving labor, because there is so much joy to be had when you and a group of friends take your cameras out for an excursion together. My hope is that, as you read and use this book, you will gain a greater love for not only photography, but also for investing time with others. It has been fun writing and publishing this book, but just writing it is no good if I keep it to myself. So, that’s why I want to share it with you! There is more to come!! 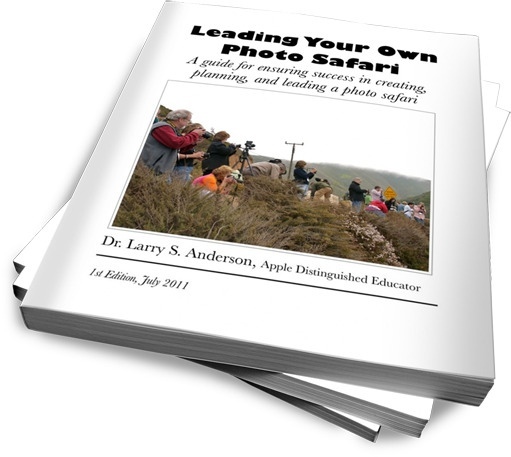 Leading Your Own Photo Safari will serve as the centerpiece for a collection of multimedia tools and resources that will appear on iTunes U, in the channel created by Apple Distinguished Educators (ADEs). So, be sure to watch for that. Please share with me any of your experiences about your Photo Safaris…and maybe your ideas will appear in the forthcoming revision of Leading Your Own Photo Safari! When you complete the form below, there is no “catch” to entering your info…it’s just for my general knowledge — and to allow me to inform everybody of updated versions when they come out. I absolutely will not share your information with anyone else. It’s just between us. OK?